Adrian Fog was born from the idea that Pinot Noir should have a sense of place and that the vineyard is the birthplace of great wine. All of the wines are sourced from vineyards selected for their individuality and Pinot Noir bottlings are determined by the wine's individuality. The wines are produced in small lots ranging from a little over 20 cases to 330 cases. Picking, racking, and bottling are scheduled as close to the night of the full moon as possible. The owners have found that she (Adrian Fog) likes and enjoys the effects of the lunar cycle. They encourage you to drink Adrian Fog on the night of a full moon to enjoy her full seductive essence. Annual production is 1,000 cases. Tasting is by appointment at the small winery on Gravenstein Highway (old Vacu-Dry plant) in Sebastopol (707-431-1174). The wines are sold through a mailing list with some retail distribution. 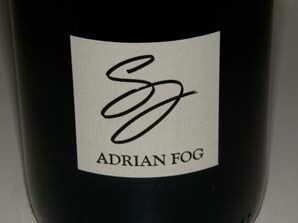 In 2009, Adrian Fog is celebrating ten vintages. I have only sampled a couple of wines through the years, with the $75 price and resulting price/quality ratio deterring my interest.